Britt Rathbone is a licensed clinical social worker, specializing in the treatment of adolescents. Mr. Rathbone graduated from the School of Social Work at Columbia University in 1986, and has worked exclusively with adolescents and their families since obtaining his degree. He has worked with adolescents in both agency and private settings. Mr. Rathbone treats a wide variety of adolescent mental health issues, and has a special interest in challenging and difficult to treat adolescents, and teenagers who have had previous treatment failures. He is active in training other therapists, speaks often to professional and lay groups on issues of adolescence and taught the course Clinical Social Work With Adolescents and Young Adults to advanced level social work graduate students at the Catholic University of America for many years. He is the coauthor of two professional books DBT for At-Risk Adolescents: A Practitioner’s Guide to Treating Challenging Behavior Problems and What Works For Teens, as well as the parenting book Parenting A Teen Who Has Intense Emotions. More information about his relational model for enhancing therapy with adolescents is available at What Works With Teens. Washingtonian Magazine has consistently named Mr. Rathbone one of Washington’s best therapists for adolescents, and one of Washington’s best therapists for group therapy. 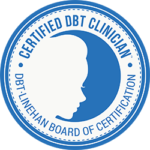 He is among the first therapists in the world and was the first therapist in the metropolitan DC area to be certified by the DBT-Linehan Board of Certification as a Certified DBT Clinician. This is the only certification approved by the treatment creator. Mr. Rathbone is a member of the Academy of Certified Social Workers, the Greater Washington Society for Clinical Social Work, the American Group Psychotherapy Association, and is designated a Diplomate in Clinical Social Work, the highest level of recognition available through professional societies.